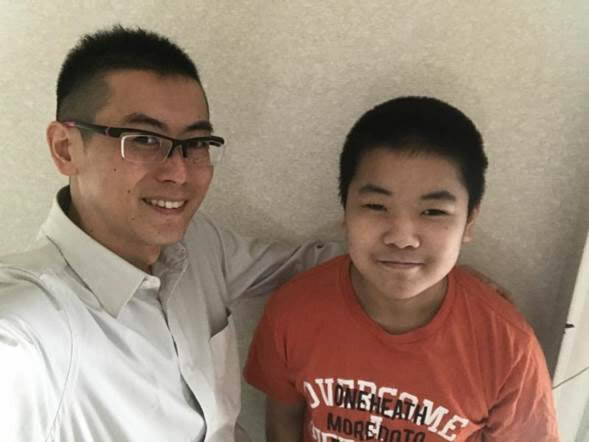 Masumi Takahasi, a Japanese business owner and CEO, is a certified Connection Practice trainer who shares this story: One morning three years ago, my nine-year-old son, Makoto, told me he could not stand up. I thought he was joking and I tried to stand him up, but his leg muscles seemed to have no strength. We took him to the hospital but, after many exams, the doctors couldn't figure out the cause of the problem. Makoto started using a wheelchair. At that time, I had achieved my goal of bigger company profits. However, I believed that hard work "now" would give my family happiness "later." So I worked even harder day and night. Then, one morning, I couldn't get out of bed as my body wouldn't move. Finally I somehow dragged myself up. I was desperate to get out of this situation and a friend convinced me to buy "Nonviolent Communication: A Language of Life" by Marshall Rosenberg. My wife and I did the exercises in it for six hours straight. For the first time, I got in touch with my painful feelings and cried and cried. After all the tears, hope emerged and the next morning, I was able to move. Eventually I found the Connection Practice, which combines the empathy I discovered in Nonviolent Communication with insight through heart-brain coherence. When I was learning Part 2 of the Connection Practice, I used the case of my son not being able to walk and I guessed that my son was feeling lonely. The insight I got was an image of a walking trail in our neighborhood. I realized it had been a long time since I walked with Makoto and I could invite him to go for a walk. At breakfast the next day, I asked Makoto, "Would you like to go for a walk with me on the next holiday?" He said, "Yes" with a radiant smile I had never seen before. Then I asked, "I'm wondering, is it important to you to be connected heart-to-heart with me?" He thought for a while and then said, "YES", again with a smile I had never seen before. I had never noticed Makoto's facial expression before and was only aware of it now because of the empathy and insight I'd learned from the Connection Practice. That evening, after nearly two years, my son started walking again. When I heard that news, I fell to my knees in gratitude. My son had never told me he was lonely, but his body was communicating that by not walking. Now Makoto is healthy and he participated in the first Connection Practice Family Camp in 2016. Since then, I spend as much time as possible with my family and I listen to them empathically. I'm happy just knowing my family is in good health. Hey Buddy!, I found this information for you: "Extraordinary results for Makoto, Masumi’s son". Here is the website link: https://connectionpractice.org/extraordinary-results-for-makoto-masumis-son/. Thank you.